This is a sponsored conversation written by me on behalf of SanDisk, a Western Digital brand. The opinions and text are all mine. What do you do when your phone runs out of space and it is the *middle* of your kiddo’s performance!! It’s happened to me and let me tell you the tears afterwards as your kiddo wonders where their video is, are NOT pretty. Many thanks to SanDisk for sponsoring this post and sending me my very own SANDISK IXPAND™ FLASH DRIVE – it works on both the iPhone and iPad – even with my bulky case. With all the videos and apps I download, it seems my phone never has enough space; this is a lifesaver! Keep reading for 5 Space Saving Hacks for your iPhone. What to do when my phone runs out of space. 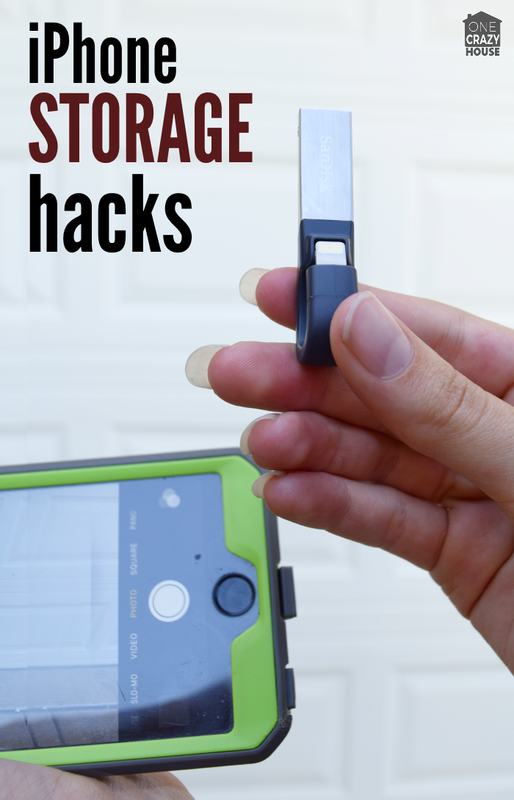 Put these iPhone Storage Hacks to use – ASAP! 1) Order the SanDisk iXpand™ Flash Drive. 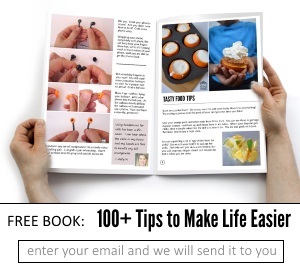 You’ll want to have it handy for next time! And it has a nifty loop so it is easy to add to your keychain or whatever! We even have a nifty coupon for $50 off until August 31, 2016. 2) Check how much “Capacity” or space you have remaining. This will let you know how crucial your space issue is. To check your capacity, click on the [SETTINGS] icon. It is a grey wheel. Once there, open up your [ABOUT] page. This tells you how big your phone is and how much capacity is left. If it is an “emergency” situation, cause, yes, missing your kiddo’s performance is an “emergency!”. You can see quickly how much space you need to free up. 3) Clean House in Your Apps. When you have to get space *now* I find that it is easier to delete an unused or even a bulky app I can re-download later, than it is to go through my photos or videos. From your settings page, click on [STORAGE & iCLOUD USAGE]. Then click on [MANAGE STORAGE]. Do you see any apps from that list that you can quickly delete and re-add later if needed? Or even just apps you accidentally added and never use?? If needed, you can recheck your capacity to make sure you have space again… or just start filming!! 4) Go through your Phone’s “Clutter”. This is what you can do to clean up your phone’s space, once you are no longer in your “emergency” scenario. Delete the photos and videos that you don’t want to keep. 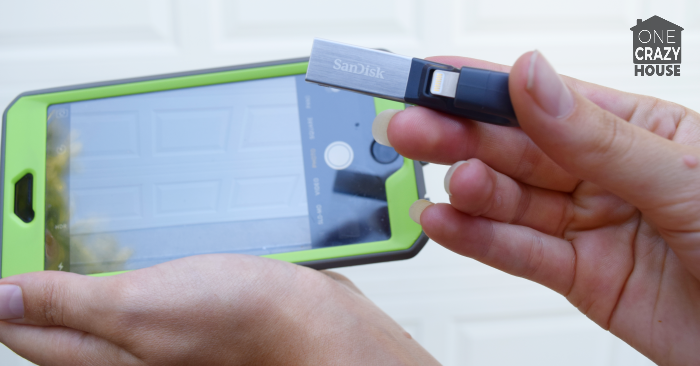 Move the ones you do want to keep over to your SanDisk iXpand™ Flash Drive once it arrives in the mail. The SanDisk iXpand™ Drive lets you move the items from that drive onto your computer or an external hard drive when you have the time/opportunity. One of the things I just *love* about my iXpand Drive is that it has an auto sync feature, making downloading and uploading my files *super* easy!! And the USB feature is totally convenient – I don’t need to track down my cables and get them out of the charging station to just move files! 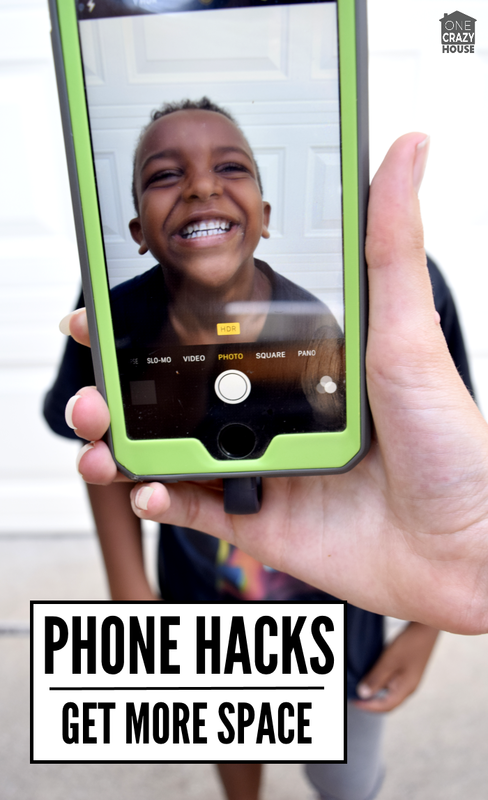 5) Keep the Phone Clutter at Bay! 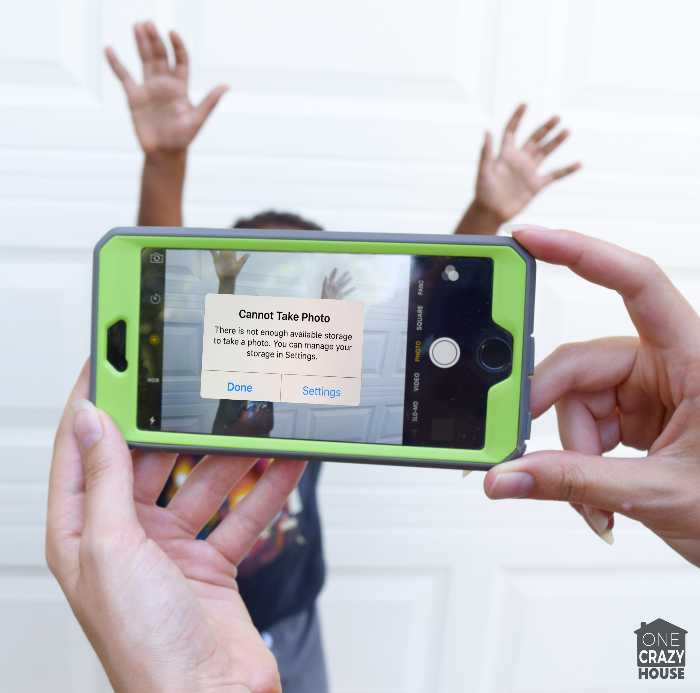 One of the things that has helped me since that fateful day where I failed to tape my kids performance, was organizing my phone and text messages. Being organized helps prevent storage catastrophes from building up! Make folders of rarely used apps. Sort read emails into folders or delete them. Take your games off the front screen, this will improve your productivity! SanDisk is a trademark of Western Digital Corporation or its affiliates, registered in the U.S. and other countries. iXpand is a trademark of Western Digital Corporation or its affiliates. Apple, the Apple logo, iPhone and iPad are trademarks of Apple Inc., registered in the US and other countries. App Store is a service mark of Apple Inc. Other brand names mentioned herein are for identification purposes only and may be the trademark(s) of their respective holder(s).